Does anyone here own a copy of the Signet Classics English translation with that awful introduction by John Flynn? If so, please contact me. Trying to make a list of his errors in that introduction but I don't have quite the complete text due to the preview limits on Google Books. I thought I had it, so I pulled out my huge tub of books that don't fit on my bookshelf. I don't have it. Oh, sorry for making you do that! Don't be disappointed for not having it -- it's not worth owning. Thanks anyway. I've got my hands on the intro now, so no-one else needs to bother searching. I've never managed to find a copy of Flynn's book, Phantoms of the Opera. Despite what I've heard about it also being riddled with inaccuracies, I'd still like to check it out. ETA: This may be a good place to ask this... I'm looking for a photo of the cover of an earlier Signet Classics edition of the novel. I think it was released in 1988 or '89, since the introduction mentions that the Broadway premiere of ALW's show took place very recently. I don't remember who the intro was by, but the cover is kinda yellowish and has a picture of the lower half of a face, with a very ghostly figure underneath it. I've looked on Google, Amazon, and even Signet's homepage, but so far, no luck. I'm asking this simply because this was the first copy of Leroux I ever read (from my high school's library), so it's got a bit of sentimental value for me. Any help would be greatly appreciated. I'm pretty sure that's the version I own. I'll get a pic of the cover loaded later on. Thanks so much! And just out of curiosity, who was the introduction by in this version? I'll let you know once I'm home from work. So is this the one you were referring to? If so, the intro is by Max Byrd. Yep, that's the one! Thank you so much! I must admit, that's a pretty nifty-looking cover. • on p. viii, Flynn writes: “Though the original classic by Frenchman Monsieur Gaston Leroux is a fairly recent entry (published 1911)…”. In actual fact, the novel was first published in book form in 1910 in Leroux’s native France, following a serialization that began in 1909. • “Educated at the College of Eu, Gaston excelled in all disciplines” (p. xiv). Aside from the minor fact that Flynn’s use of Leroux’s first name here comes across as extremely unprofessional, this sentence also includes a misleading mistranslation. Leroux did indeed attend the Collège d’Eu, but a collège in French is no more than a junior high school for pupils aged between 11 and 14. To use the English word “College” in this context is likely to mislead American readers. 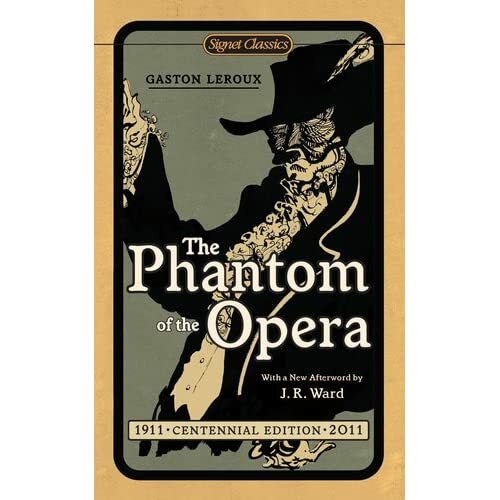 • Flynn states on p. xv: “In 1910, [Leroux] began work on […] The Phantom of the Opera”. This is not the case. Leroux first mentioned that he had begun work on the novel in a letter dated April 1908, and the serialization of the finished work in the French newspaper Le Gaulois was already underway in September 1909. • “Charles Garnier’s 1860 playhouse” (p. xv). 1860 is a puzzling choice of year by which to date the Paris Opera House. Construction work on the building did not commence until 1861 and indeed the edifice was not completed until 1875. • “Indeed, as Gaston Leroux contends in the introduction, many of the events in the novel are real” (p. xv). Though much of Leroux’s inspiration undeniably derives from real-life events, this sentence is deceptive as it implies Dr Flynn’s accord with this statement, which is actually untrue. The sources of inspiration may have been real historical events, but their exact details have been fictionalized to a considerable degree such that not one of the events in the novel can truly be considered truly “real”. Furthermore, Flynn commits an extremely basic error here of confusing the author (Gaston Leroux) with the narrator (G.L.). It is in fact the latter speaking in the introduction, not the former. • “The Phantom of the Opera was published in book form in 1911” (p. xv). As previously stated, this is extremely misleading. The novel was first published in book form in February 1910 in Leroux’s native France; 1911 is merely the date of the first translation into English by Alexander Teixeira de Mattos. • on p. xvi, Flynn claims that “soon not a bookstore in Paris could keep up with demand for the novel” following the release of the first motion picture adaptation in 1925. There is no evidence for this. In reality, sales in France remained mostly modest compared to sales of Leroux’s other works. • “…not one of [Leroux’s other novels] would capture the imagination of future generations like The Phantom of the Opera”. This is also misleading due to its ethnocentricity. Among both the French and academics, Leroux is of note not for The Phantom but for his 1907 detective novel Le Mystère de la chambre jaune (The Mystery of the Yellow Room). Leroux’s Rouletabille stories are far more well-known in France than Le Fantôme de l’Opéra. • “Because of his health problems related to his obesity, Leroux never had the opportunity to see the silent film version” (p. xvi). This is, perhaps, the most ridiculous of Flynn’s claims. It has already been established that Leroux is likely to have seen the 1925 film, especially since he wrote about it in a document that is included in the edition of the original novel published by Robert Laffont in France and the manuscript of which I have personally seen. Leroux in fact wrote that the film was “one of the most extraordinary films, and perhaps the most sumptuous, of [his] time”. • “Even on his deathbed, Leroux maintained that his ‘Opera Ghost really did exist!’” (p. xvi). There is not a shred of evidence for this. It is also highly unlikely that Leroux said anything of the sort on his deathbed, given that Le Fantôme was not a work to which he was necessarily more attached to than his others. YEAH, SCORPY! YOU TAKE THAT ILL INFORMED PHD DOWN! If anyone here gets it, let me know what the afterword is like. Someone explain to me wtf is up with the Phantom's mask? Is that a mustache under his nose? Don't get me wrong, I like how they're attempting to pay tribute to the original French cover, but really... What the hell?! Think I'll stick to just getting the new Penguin translation... though if I see this one in a local bookstore, I'll check out the afterword. IamErik771 wrote: Is that a mustache under his nose? Don't get me wrong, I like how they're attempting to pay tribute to the original French cover, but really... What the hell?! Forget the mustache, is that a feather in his hat? When did Erik become a pimp? Maybe they think that the feather, mustache, and ruffled shirt makes the Phantom look more young 'n sexah?